This review first appeared in the June 27, 1997 issue of the North County Times. Some people the good Lord just overloads with gifts. 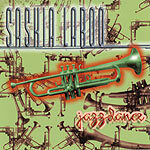 Take Saskia Laroo. It's not enough that she's a knockout to make Christie Brinkley jealous, she also plays trumpet like Miles Davis. Especially Miles at the end of his career, when he was playing acid jazz  helping to invent it, actually, on his last album, "doo bop." Apparently, Finland  from whence Laroo hails  has some kind of hip hop scene, because her album just sizzles with the kind of heat that can't be faked or picked up on the fly. Joined by rappers Kool Ace, Johnny Kelvin, Mac Maestro and QF Da Funkee P, Laroo and co-composer Rob Gaasterland lay down a hypnotic dance trance on drum machine and synths  with Laroo riding over top of it with her muted trumpet solos that, as mentioned, evoke the sound and spirit of Miles. Good stuff here: danceable, listenable, fun.